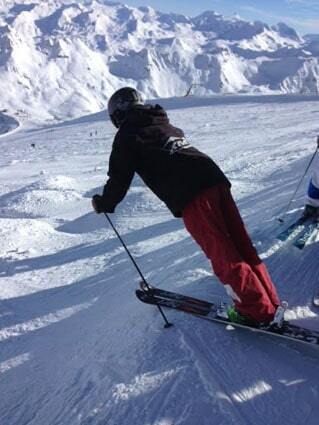 Killington Mountain School Freestyle Coach Glenn Eddy checked in last week from Tignes, France where he, Coach Paddy Dayton, and a group of Freestyle student-athletes have been training in outstanding conditions for just under two weeks. Sunday night the group celebrated student-athlete Alex’s Lewis’s 15th birthday with a team dinner at Le Petit Savoyard, a restaurant near where the group is staying. Alex Lewis decided that they all needed to try the local French cuisine, and everyone had a great time enjoying Tartiflette and Fondue Savoyarde. Eddy says that since the last big storm, the weather has been spectacular, and the course has been in great shape. The athletes have been training top to bottom runs with airs alongside the French, Italian and Swiss National Teams as well as some club teams from France. He says that slowly, but surely, the runs are starting to come together. The group took a shuttle down to the airport in Geneva and then flew to Montreal Sunday evening, Nov. 23, arriving back in Killington a few hours later.